When upgrading a website to a new design, carrying out bug fixes at the backend and updating the website core CMS, themes and plugins works best when the site is placed in maintenance mode while you are working. When a website is in maintenance mode, public access is blocked and a splash page (informing visitors that the site is down for maintenance) displayed. If your website is powered by WordPress, putting it into maintenance mode is as easy as installing and activating the WP Maintenance Mode plugin. 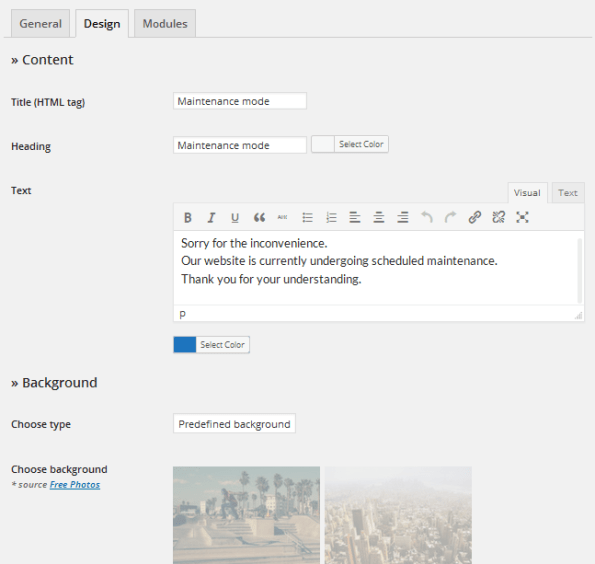 With WP Maintenance Mode, you can seamlessly add a maintenance page to your blog that lets visitors know when it is down for maintenance, or add a coming soon page for a new website. Only users with admin privileges are allowed full access to the blog including the front end. Fully customizable with options to change the background image, colors, font and text. Subscription form to capture visitors email while in maintenance mode. Countdown timer to the day website will be operational. Full support for WordPress multi-site. Let’s walk through the set up of WP Maintenance Mode plugin. First off, install and activate the WP Maintenance Mode plugin. At the plugin settings page under the maintenance tab, check the Activated radio button to activate maintenance mode. The General tab contains other configurable options such as: user role that is allowed to access the backend and front-end of the site, whether or not to make the site index-able by Google etc. Navigate to the Design tab to customize the maintenance page such as changing the page title, heading and maintenance text; altering the font color; and an option to upload a custom background image or use a predefined background photo. 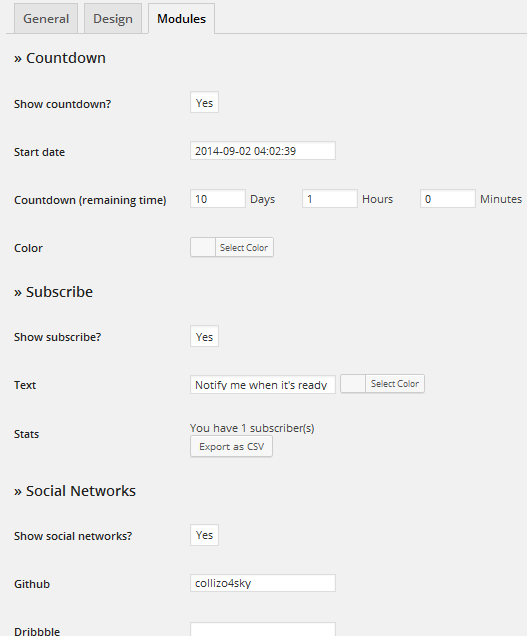 As previously mentioned, the plugin also comes with a countdown timer, subscription form and social icons. These features and more are available for configuration at the Modules tab. We hope you find this tutorial helpful in setting up the WP Maintenance Mode plugin for your site. Have any questions or contributions? Please let us know in the comments. I really don’t have idea about the possible cause of your problem. i guess this issue is unique to your site. If you own another WordPress site, try it and see if it still persist. To that end, i will inform the plugin developers about this problem. Our Maintenance Mode Page does show when we disconnect as admin, but not showing in our second browser as visitors. Note: we always work with 2 browsers, Google and Firefox. Even deactivated our WP Security plugin was affecting it… till it finally let go. Did you try logging out to see what a non-registered user sees? Actually, it is better is you deactivate cache plugins while you work on your site. If you don’t, changes and modifications you make to your site will not be seen live until you click refresh a dozen times, very annoying. When you are done modifying your site and put it for all to see again, re-activate the cache plugin. I disabled WP Super Cache to test, but the message remains. Another possible cause of this problem is because you didn’t clear your browser cache before previewing your site. If you’ve deactivated WP Super Cache plugin, clear your browser cache and you should be good to go. Have you an file lang for fr-FR, would you an *.po ? Hi, plugin already localized in French. No need providing a PO file. Activate the plugin and it should be displayed in your native language French. In the previous version of Maintenance Mode it was possible to show a user login on the activated Maintenance Mode page. I can’t find this option now. Could you please help me? This plugin is meant to put a website in maintenance mode. really don’t think it’s appropriate for it to a login page. If you are the admin of the WordPress site, you should have access to the back-end. Thanks Wolfgang for taking time in reviewing our plugin in your blog. I hope with what you’ve done, more people from your native will use this plugin. Great plugin works great. One thing though, how to I activate the css file attached to the assets page? The requested URL /attachment_category/directory/ was not found on this server. I’ve uninstalled the plugin but there is no change. How can I fix this? Updating your site permalinks might fix this problem. Go to Settings >> Permalinks and hit the “Save Changes” button. YES that took care of the issue. Thank you! Necesito que el formulario de contacto esté en español, cómo hago eso? Works, but if I log out and try to go to /wp-admin it doesn’t allow me to login to the backend. The WP Super Cache is disabled and I cleared my browser cache, but the message remains. I activate the maintenance mode in my site And when I want disabile it, the site are Forever in maintenance mode. The maintenance mode son’t want disabile! The problem is you cache plugin. Read the comments. How I can help you? I don’t know nothing about your website. Try to rename the plugin folder through FTP, it will disable automatically. Did you have installed plugins? Write here the list please. Please send me your skype id via email contact [at] georgejipa.com, so we can solve it faster. Thanks! The problem is not the plugin WP-Maintenance, but a modules of Maintenance of my themes! Me this same thing happening. What can I do? And thanks for answering George Jipa. Just installed on 5 x sites that we want to take down temporarily but can’t get it to work. Have checked settings of Maintenance Mode itself and all appears fine, but nothing changes on front end. There are no caching plugins installed on any of the 5 x sites, and browser is not caching. Also tried disabling ALL plugins (except this one of course) . . . still doesn’t work . . .
@Cesar: update to the latest version. Ah, that’s one of those “doh” moments lol . . . still logged in so still seeing the original site, log out and all is fine. Thanks George Jipa, was a cache plugins. This plugin is fantastic, though I was wondering one thing. Is there a way to set the site out of maintenance mode once the countdown timer runs out? I understand what you want, but for now there’s no feature doing this. If you know PHP and WordPress… the plugin can be extended by doing a cronjob to get the countdown value and set status to ‘deactivated’ when the countdown timer runs out. On the maintenance page, I can’t make an image larger than width 600 pixels appear align centered. Here’s the code – what am I doing wrong? Also, it accumulates the emails of those who have subscribed in a CSV file but the email is not received… is that the norm? 1. I don’t see the code ? Anyway, the content is limited to 605px and has margin: 0 auto. Try to resize that image to 600px and I think it will be fine. 2. The feature is just collecting the emails. After that you can download the .csv and import into any email marketing service like mailchimp, campaign monitor, etc. Thanks so much for the quick response. Is there any way to increase that 605px margin? I work on a site for a friend of mine and want to show her the status of the website. The plugin is active and as the admin I can see all sites and it works well, but when I login with the account of my friend (user-role=editor) I do not geht access to the website. I only see the maintenance mode page. In the plugin-settings I have activated the plugin as admin and I have set the premission for getting access to front and backend for subscribers. Can you tell me how I fix this? If your friend’s user role is editor, then you should select “editor” from Backend & Frontend dropdown menus. Oh. Yes that makes kind of sense. I thought by selecting subscriber everyone who is “at least” subscriber can see the page. (which would mean that users with more rights can see it too). Strange we have maintenace mode active and it shows the page in firfox and mozilla but on IE and chrome we get an error. Is there a way to change the font (not font color)? The default font is not very attractive. Right now there is no builtin option for that. If you are a techie you can use available filters (wpmm_styles) and embed a new css with properties you need. Hi, the contact form does not have a success message… can you please let me know how to add a ‘success’ message to the form response? A new version will be released these days and will solve that issue. Stay close! I would like to know how I can implement the websites Favicon on the maintenance front page that the world see’s? It shows me the hosting companies Favicon, and the customer is not happy with that. For now, this feature is not builtin. But… if you are a techie, then you can use `wpmm_header` action to add a favicon. I would like the maintenance page display an adsense banner but when I write the code is cleaned up and does not appear. Where do I write the code because the banner to appear? want to give you my compliments for this plugin, been using it for a long time now. I recently ran into a similar problem as Mary had in here comment of nov 9. Is already implemented in the new version. Will be available ASAP. Hi, I’m having trouble with the plugin, I have it set up for admin to access back end and subscribers set to front end and the subscribe button on the maintenance page but if somebody subscribes they still cannot access the site although I can see their email address has been added. Any ideas? Thanks for the reply George, I need to give some people the availability to view the site whilst in maintainance mode. Is this possible? 1. give them access based on their IP. Add the IP to exclude list from General tab. 2. register a new user with subscriber role and then add that role to “Frontend role”. After they login with that credentials they should see the frontend. The plugin has some issues with the backend access based on user role, but they’re solved and will be available in the next version. Love the plugin btw! What about multiple roles? I created a new role based on ‘Editor’ that has additional capabilities, right now Ill have to switch back and forth to allow different groups access. Is there a way to allow multiple? Do it already do this for standard roles (ie: editor and higher)? What should I do to enter the code for a box of google adsense to make it display in the maintenance mode page? Hi, first of all thanks for your great work. I’ve a little issue with your plugin: when I try to share something through Facebook a “Maintenance Mode” text appears instead of the content of the article. Solved, Facebook has cached my OpenGraph content. Hi my subscribe box isn’t sending me emails nor are the social media links? I see so I need another plug in to receive the subcribers emails? The links to social media are not working. They seem to just refresh the page. 1. Already have their emails (if they subscribe). You just need to export them (plugin settings -> Modules -> Subscribers) and import to any Newsletter service. I have the same problem. Could you fix it? Can I ask – what css file the page links to? Can I dig in and offer more fonts and styling etc? 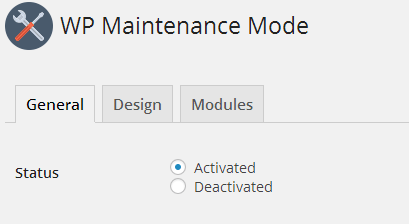 I use the plugin “WP Maintenance Mode” (version 2.0.3). I’m using it on wordpress 4.1.1. When I activate It, the backend is always accessible for any kind of user also if I select Administrator. Great plugin. Need to have a timed event. I would like to schedule times when this plugin activates then deactivates. One thing I would love to see is changing the language of button(s). But only with facebook! What can I do? I would like to know if it’s possible to change the color of the social icons ? I’ve installed and activated your maintenance plugin. However, my uploaded background image appears to be cropped. Eventhough, I’ve changed my image size to the recommended one on your design tab. Please help me to understand if I need to change any settings or edit my image size to fit? Much appreciated, thanks. Hey there, plugin works fantastic. My question, can i modify the color of the facebook buttom? Is there a way to edit the subscribers list? I like that I can use a custom image for my background but my issue is that, I want to be able to edit my website and see it on my website without having to use the “customize” feature. Every time I activate maintenance mode, I cannot see any of my pages because all I see is the custom image I used for the maintenance message. I want to be able to show the maintenance mode only to regular users but still be able to access the front end. I thought WP Maintenance Mode allows admins to access both back and front end? The plugin isn’t letting me work on my pages and see the results even when I am logged in as adminstrator. How can I update my website while in maintenance mode? I love this plugin and have used it on two of my sites now, thank you. Is there a way to allow another popup WordPress plugin to run while in maintenance mode? I want to use Leadin from Hubspot for more sophisticated email collection while still in maintenance mode. By default you can’t use that plugin, but you can install the tracking code (from https://app.hubspot.com/leadin/ -> Settings -> Instalation) and set all flows from hubspot dashboard. I’d like to exclude the homepage from maintenance mode. I tried adding ‘home’ in the bypass section, but that didn’t work out. Any ideas? Right now there is no option to bypass the homepage of the website. Maybe in a future release we will add this feature. Hi, first of all thanks for your great plugin. I’ve a little issue with setting / design : I don’t see the maintenance text and so I can’t access the box and can’t change the default text. Except this everything is ok. The maintenance text can be changed from “Settings” > “WP Maintenance Mode” > “Design” tab. And you can see the maintenance page only if you’re not logged in… so you should open the website in another browser or incognito mode. I can’t download csv file, so what could I do? How could I fix this problem? I’m using it as a coming soon page with a countdown timer. Other suggestions for using the timer? This should work well. Update edits not a problem this time with the short time before going live. Thanks a lot for that plugin! Works fine on single-site installation as well as on multi-site, … until I changed the multisite-type to “Subdomain”. In the backend I’m logged in as Superadmin and go to my primary website – the Maintenance-page appears instead of my site-pages with the admin-toolbar in top. The plugin is not activated for the network – I’ve activated it in my primary website. thanks for this nice plug-in. I added another plug-in with which people can share a page or post on facebook. It seems that any page or post created DURING maintenance, after deactivating and even removing your plug-in supplies the “maintenance mode” message as the post or page to share on facebook, while any page or post created outside the maintenance window (before and after) works well. What can I do? Please advice. I can give you two examples/links of my test website to show you if you contact me. I am new in the development of website. After installing and activating wp maintenance, I do not know how to access my administration dashboard! I’d like to know how to personalized the css of button contact form ? Plugin works fine. So far thanks for the work! But how can I alter the position of e.g. of the subscription form? When I change the text in the ‘subscribe’ area and it’s too short the whole design goes one line up, but background image stays. It would be also nice, if the plugin would detect the screen resolution/size of the browser window of the user, so the design adjusts to the resolution. Also on Android it looks far different than on my PC. How can I solve these? I am new to WP, so if there is already a solution, I would be grateful for pointing me to the right direction. – When someone subscribes with their email adress no message appears to show that subscription is done. Something you are familiar with? – The time stamp for the local time is wrong but in the layout it shows the right time (when choosing how the hours and minutes would be shown) so in the csv file the time stamps are for an other reigon. – How can I change the example text color in the subscribtion field and also the button color? – Is it possible to choose instagram as a link? – Can I move the count down to the top of the site? So this is wokring fine. But the adress won’t be added to the subscribers list. The modul in the backend still stats “0 subscribers”. Any ideas? Are there any known conflicts with plugins like “user role editor” or do we have to set special permissions? great and easy to use plugin. I found one issue with the linked background image. This uses always unsecure http:// based source links and this causes an error message in current browsers in case your site i running https only. maybe some one can fix this. thx! Hello. I have been able to implement this on a site I am building; however, when I place an image link within the “Content” -> “Text” area it appears on my site but now I cannot access the management panel – when going to settings, it is only a white box. Can I get some help with this? If need be, I guess I’ll have to uninstall the plugin and reinstall and hope that it forgets my settings. Hi Agbonghama Collins, I need help. I would like to use a custom font in your maintenance plugin. How can I do? thanks for your plugin. I have one question for you. Can i change colour and text or language of button Contact us? Because i have white background. Thanks for your answer.